An annual holiday event for Cam is the Mary Free Bed Dr. Swanson Christmas party. For the last three years, the invitation for the party has featured Cameron's pic on the front. This year, more than ever before, Cam was excited to see Santa and all of the characters. Auntie Ronda accompanied us, much to Cam's delight, and hers. We can't thank her enough for joining in the fun. There are three different areas to visit when one arrives- arts and crafts, cookie decorating, and Santa with his elves. The order of agenda, predicated by Cam, was Santa, cookies, and crafting- he had very set priorities! After talking to the elves and hanging out with the white bearded guy, we made our way to cookie decorating. The cookies were huge and we all took part in adding frosting and sprinkles and then happily partaking by devouring our artwork. As we headed to the craft area, we realized it was too late as the supplies had been packed up. Luckily, we ran into Marci, our good buddy who nicknamed Cam, "Camarooni" and she was able to find a couple of ornaments for Cam to take home. 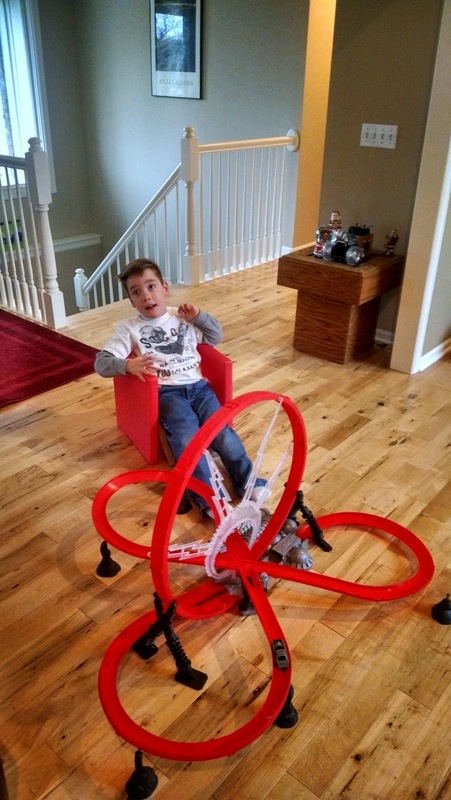 Upon arrival there, our patient boy opened his present from Santa- a light up, magnetized race track! Over the weekend, Jane flew to Asheville, North Carolina to spend the weekend with one of her best buddies, Leslie. Jane had so much fun in the mountains and seeing Leslie's wonderful fam. The boys stayed home and with Emma's assistance, completed a gingerbread house kit and wrestled with the setup of the cool racetrack. For our favorites who are near and those too far away, we are grateful for time spent and awesome memories made!